Royal Pains: Mexican Heartthrob Khotan On His First English-Speaking Role! 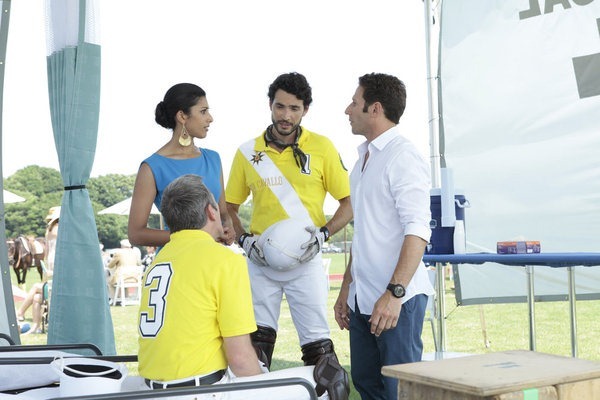 Last week, USA Network’s Royal Pains (Wednesday, 9/8C) introduced a new love interest for the show’s hard-working Divya – a globetrotting polo player named Rafa, who is played by Mexican soaps star/heartthrob, Khotan. This week, things get even more interesting. On Monday, Khotan spoke with a group of journalists/bloggers about his first English-speaking role and working with Reshma Shetty. Khotan can you tell us about your experience taping Royal Pains, are you at the Hamptons now? Khotan: No I’m in the – watching a storm from my window in Miami actually. Can you tell us a little bit about your experience recording Royal Pains and how you got to be there? Khotan: Absolutely, it’s been a great experience actually. It’s like – it’s, you know, traveling back and forth to New York but, you know, I’ve never shot around those areas in New York. So it’s been great getting to know those locations and just the general experience of doing a first American TV show has been awesome. Well you just mentioned that this is your first work on like, you know, American TV series. I know you’ve done, you know, tons of stuff with ((foreign language spoken)). So as an actor what is the biggest difference that you’ve seen working on ((foreign language spoken)) versus working on like a TV series comedy drama. Khotan: Well the dynamics of doing a series like this is quite different, you know, a show like this takes a whole week to do just one episode. So, you know, just the whole process is different and I would say closer to actually shooting like a film, you know, because they are very meticulous on their takes and the different angles, you know, they need to cover. You know in the Soap we do 15 to 20 scenes a day. So this for me is great because as an actor you get much more time to prepare for a scene and to go over it with the other actor. Also every episode that I’ve been (in) has been a different director that’s, you know, directing the episode. So that was a little bit surprising to me actually and it’s been just great to, you know, be directed by different people who give it a different touch to each episode. (Unintelligible) I’ve also had the great experience of junior lead through, which is just everyone sitting down and going over the full episode just to see how it’s, you know, how it feels and – sorry one second. You know, just to see how the episode feels and then they make changes accordingly. And it’s been great because I – you know, the writers have the sense of what it is that they need to change or adapt in the scene to make it work better. And even though sometime the changes are small they totally make sense. So, you know, it’s – I have to say it’s been a dream come true to me to do a TV show like this with this kind of production quality and, you know, and for such a successful show. Great thanks and a second part of the question I’m not allowed – I’m not allowed to keep asking another question but your movie (unintelligible) your English is perfect. Do you prepare differently for your roles that are, you know, ((foreign language spoken)) they’re obviously Spanish dominant. So you prepare any differently with depending on what language you’re going to be required to perform in? Khotan: Well this – not really, what I – I try to be authentic and for me the most important thing is for the character to be convincing if some of it’s in Spanish or English I want it to be convincing. I do, you know, I was a little concerned with the timing and the momentum of certain, you know, when you’re acting your English it is a little bit different. There’s a timing thing there that’s different. I don’t quite know how to describe it but it has to do with just the – obviously there’s a music term for it but I can’t remember what it’s called. But it has to do with the timing, you know, how words flow, you know, which I wanted to get right. I wanted to, you know, feel magical, I didn’t want it to feel awkward. I just – and also the acting tone for me was important. You know, usually (when) you’re on Soaps you have – the tone is a little up there because it’s a melodrama and it’s just a style that is developed. Here, you know, you go for a much more natural kind of acting. So, you know, it was great to watch the other actors and see some of the show that could be (unintelligible) with what they were doing. I just have a question about Divya. Where do you see your relationship with her going? I know that you guys kind of had that steamy kiss scene at the last episode. So what do you see happening for those two characters? Khotan: Well, you know, I think Rafa is – instinct as a person and, you know, he was sensing the attraction. I think they’re going to have a steamy summer for sure. You know, I can’t tell you much where it’s going but I do have to say there are some surprises. He’s not as predictable as you might think. You’re going to see the surprises there on their relationship. You know and it’s, you know, when you meet someone and there’s that very big attraction, you know, things happen fast. And there at the best – it’s at the best phase, you know, when you’re getting to know each other and you know. But as I said, I don’t want to reveal much but there are some unexpected twists there for sure. I was just wondering what was it like working with – I know like on a Soap Opera you’re working with a lot of female characters, there’s like a lot of love angles. I’m just wondering what the difference was between working with one of those stars versus with Reshma? Khotan: Well Reshma is absolutely great. You know, she’s – I had to learn from her because she was very helpful, you know, on the first few days of me shooting because I had a lot of questions and she was always very supportive on that. So I appreciate her being like that. Also, you know, the first time I met her was on the – doing the casting for the show. They flew me to New York and they wanted to see, you know, how we would interact and the chemistry and all that. And you know, she was really nice from the beginning. And you know, I think all the scenes we’ve done so far have been great and I have to say some of them have been, you know, quite steamy and, you know, sometimes, you know, you need to have the confidence with (unintelligible) when something like that comes up. Well, so I mean all I can say it’s just been really great working with her. And of course, you know, she has the wonderful British accent, I love the way she talks. And we’ve had a lot of fun actually. Previous PostLawless: Not Quite The Film It Wants To Be But Still Very Good!Next PostRoyal Pains: HankMed Gets A Famous Patient; Paige Gets Ready for School; Divya Gets It Bad!